Typing text on mobile device can be very slow with the limitation of tiny keypad that it has been designed with. That is one of the limitations that the mobile designers need to be bear with or else it will affect the overall size and whole appearance of the mobile devices. Although there are already some great designs that can help to speed up the text messaging typing such as hardware QWERTY keyboard, intelligent predictive input keys but none of them is perfect enough that eventually drive more ideas towards a greater desktop typing experience on mobile devices. Now with the new patent filing from RIM, a manufacturer that is famous for its compact and tiny hard QWERTY keyboard being integrated into its blackberry phone itself, hopefully this is another great potential technology break though that can change the conventional way of how keypad was designed. 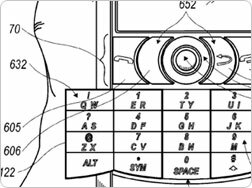 Normally, a mobile device is too space constraint to have all the full QWERTY keys in one row but the patent filing suggested a new way of having a foldable section on both hinged area that can be expanded to allow bigger keypad size for faster typing. And when not in use, it can be folded that it would just appear like a normal size mobile device. Besides, it provides a SureType keyboard with two characters on every button that used to be occupied by three characters in the past, making it easier to predict the right characters with only a single key press. The design doesn’t look too complicated but no doubt it is quite an innovative idea. Although the idea has been successfully filed by RIM, but it doesn’t necessarily mean that RIM is planning to have a next generation product based on this keyboard technology soon.